Describes the version management and the impact analysis when a requirement is modified. If a new requirement has been created. The impact analysis consists in analyzing the all the coverage errors after such modifications : identify all elements of output that shall be updated. REQCHECKER™ includes an impact analysis presented in the coverage matrix report. I1 has been updated in version 1. O1 must be updated : its content must be checked and maybe updated. Then its version must be updated to 1. I2 has been tagged as deleted. O2 must be updated : the coverage must be removed, and maybe the artifact removed if it becomes unused. O6 covers a requirement that has been removed. Either the coverage must be removed and maybe the artifact removed, either a requirement is missing. If requirement in not fully covered, for example I3, its status is PARTIAL. An requirement is never covered, for example I4. The error is named NO_COVERAGE_ERROR. 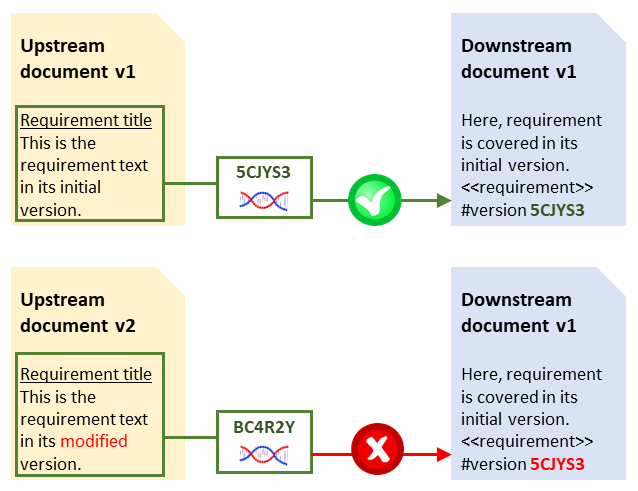 An requirement is covered with a wrong version, for example I1. The error is named BAD_VERSION_ERROR. An requirement is covered since it has been deleted, for example I2. The error is named DELETED_COVERED_ERROR. An artifact covers a missing requirement, for example O6. The error is named NO_STATEMENT_ERROR. An requirement is defined twice, for example I4. The error is named SEVERAL_STAT_ERROR. The software automatically creates a version for each requirement when no version is defined by the statement. 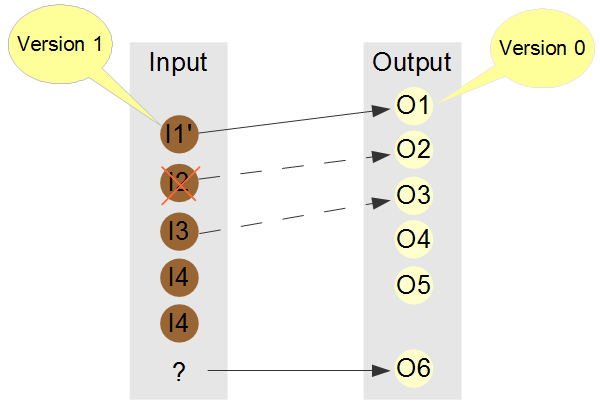 The automatic version is a 6 characters length hash number, for example 5CJYS3. The 6 characters length collision probabilities are: - If you update the requirement once, then update the coverage, the probability to skip the modification is 0.0000004%. - If you update the requirement 10 times, then update the coverage, the probability to get the same hash is 0.000016%.